Performer shows a rod with six different coloured gems on it. There are also six different coloured gems on the opposite side of the rod. Spectator selects one of the colours. 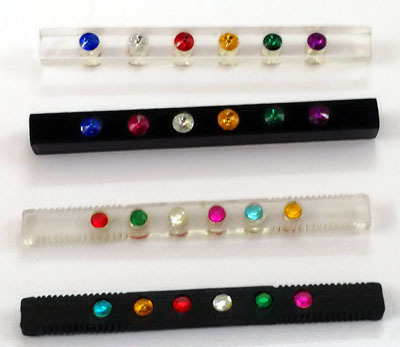 Performer magically changes all the gems to the selected colour on both sides.You get the rod, specially prepared for the trick. A classic pocket trick, and a favorite with close-up performers. We make many different models of this item, in various sizes, in plastic, and acrylic fitted with glittering gem stones.